ADHD and Control. 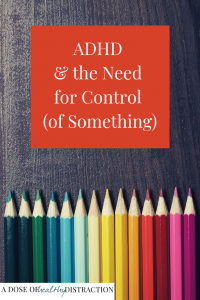 This is the thing – With ADHD we often feel like we cannot control ourselves. So some of us search for things we can control. When I was eleven my stepfather died unexpectedly, and my mother was thrust into single parenthood. As such she sought help with her two children, and my brother and I were both diagnosed with ADHD. See my story here. After one incident involving a teenage babysitter, a flooded bathroom, and my brother being chased naked by said babysitter, my mother hired a middle-aged woman named Mrs. Taylor to babysit us. One evening after my brother had gone to sleep Mrs. Taylor told me that she wouldn’t be enjoying a snack with me because she was on a low-fat diet. She explained that she had lost weight eating only 20g of fat or less per day. As a little girl who was always considered, “chubby” the idea of losing weight appealed to me. So I started counting fat grams. In fact, I thought about fat constantly. Too much for any 11 year old. Everything else in my life was decided by adults. Food and weight was something I could control. So I began picking the cheese off of sandwiches, or scraping the peanut butter off of the bread in the middle school cafeteria. I was the only girl in my school taking Ritalin, so I was NOT going to be fat on top of that humiliation. Thus began a lifelong obsession with food that has continued through today. Until my mid-20’s I wasn’t aware that my eating behaviors, and the mental gymnastics of obsessive calorie counting, were actually considered to be OCD. One of the main challenges with ADHD is feeling like you cannot control yourself. It’s painful to be acutely aware of your own lack of self-control. Obsessional thoughts are repeated images, urges, or thought patterns that are intrusive and cause someone anxiety or some other emotional distress. I will often picture my body in a swimsuit, or just the dimples on my thighs. If I’m in proximity to food my mind goes immediately to the parts of my body that I hate. I know it’s not normal, but I can’t seem to stop. Compulsive behaviors are the repetitive activities that someone with OCD feels compelled to perform as a result of the obsessional thoughts. Logging onto my fitness pal, and closing my eyes to do mental math are the most obvious compulsive behaviors in my life. I’ve been suspicious about the relationship between ADHD, anxiety, and OCD for some time. But I had no idea where to find info on it. I go to the Annual International Conference on ADHD every year. Unfortunately, I was unable to afford the extra fee for the API sessions, which started on November 8th. But I am surprisingly persistent when I’m really interested in something, so I got my hands on the slides from a session taught by Dr. Roberto Olivardia and Dr. William Dodson. Complex, Comorbid, Contraindicated, and Confusing Patients. Soooo yeah. All of those words describe ME. And perhaps some of you? Lets talk about this whole ADHD, anxiety, OCD, Confusing Patient thing. Here is my original article on Anxiety. Here is my anxiety workbook. Within the ADHD population there is roughly a 30% comorbidity with all of the anxiety disorders including OCD, generalized anxiety disorder, social anxiety disorder, panic disorder, phobias, and poor stress tolerance. According to the presentation slides Anxiety impacts ADHD by decreasing our attention, decreasing concentration, making it harder to use helping strategies, interferes with EFs, and sometimes it actually mitigates hyperactivity. Overthinking is my exercise of choice. Here is where things get really scary. Individuals with OCD AND ADHD have increased social problems, increased attention problems, increased aggressive behaviors, higher externalizing scores and more social phobia. OCD symptoms pile on in addition to the already challenging self-regulation issues inherent to ADHD. The OCD symptoms in people with ADHD are not all that different from people without ADHD. And the rates of social phobia and social problems are slightly higher in those with ADHD. There have been a few family studies that show an association between OCD and ADHD. My family absolutely should have been in this study. Overall prevalence of OCD with ADHD in study groups ranges from 10% up to about 44%. YES, you can have ADHD and Anxiety and OCD at the same time. Dr. Olivardia and Dr. Dodson have seen it and are looking into it. Thank goodness someone is! Now that I’ve gone through the information in this presentation, I plan to speak to my psychiatrist about this. It’s no surprise that my sensitive nervous system combined with my life experiences resulted in me trying to control something – anything. Perhaps my brain was trying to create some kind of release valve, or outlet, for my mental angst. As an adult I accept that there are things I cannot control. If the symptoms listed above ring true to you, and you know you have ADHD, ask your treating physician about OCD. Self-awareness and managing your mindset go a long way to feeling more in control. I can help with that. Contact me if you want to discuss ways to lose the shame, manage your emotions, and change your life for the better.